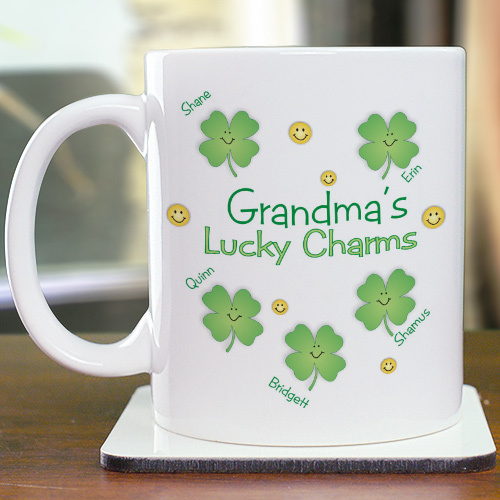 Mom, Grandmother, Nana or Aunt is sure to love her very own Customizable Coffee Mugs featuring all of her lucky charms. St. Patrick's Day is going to be extra special when you give Mom her very own St. Patrick's Day Personalized Mugs to celebrate this great Irish holiday. Our Personalized Lucky Charms Mug is available on our dishwasher safe 11 oz coffee mug. Includes FREE Personalization! Personalize your St. Patrick's Day Coffee Mug with any title and up to 30 names. It is very cute! I love it. Everyone's Irish on St. Patrick's Day. This year let the whole world know your Irish with our great selection of Personalized St. Patrick's Day Gifts. We have great gift ideas for everyone in your family including Mom, Dad, Grandma & Grandpa. Choose to wear one of our Irish shirts personalized with your name right on it or give Grandma an Irish St. Patrick's Day Gift Basket. Our Gifts are unique & creative so be sure to get your Personalized Irish Gifts today.